In the first part of my experience with the GIAC GSEC exam, I promised I would let you all in on how the exam went. The following is to be my post exam report. So we left off last time with the idea of having practice exams to get a good feel for where you stand in your general knowledge of the topic objectives and having a good detailed index. Next, we answer the question, how do we even get this exam setup in the first place? To do this, head over to the SANS webpage, log in to your account, and under Certification Attempts, you’ll be able to schedule your exam at your nearest PearsonVUE testing facility. Luckily for me, my favorite testing center, ComputerMinds, was able to accommodate me for a morning slot. The process was really easy in my opinion and wasn’t too difficult to navigate. The only problem I had with the PearsonVUE page was that I couldn’t schedule the exam on the Saturday I wanted. I had to settle for a Friday. I think this had something to do with either it being too far into the future or that it was Labor Day weekend. I shrugged that issue off and chalked it up to some bad juju. I was ready to take my exam and looking forward to closing out this journey. The morning of my exam arrives and I’m awaken to the hellish sounds of the alarm clock. I knew I’d be fighting rush hour traffic and awful construction on the way so I tossed down a couple granola bars and started driving to the testing facility. In my excitement for taking the exam, I may have misjudged my arrival time and showed up two hours early. Luckily for me, my favorite certification instructor was there and we caught up on lost time. He eventually had to start his MCSA class and I was stuck in an empty lobby with a cup full of coffee in hopes to keep my mind alert during the upcoming security onslaught. In no time, the lovely proctor showed up. She gave me the option to start early as there was an available seat in the time slot an hour before my scheduled exam time. I thought it over and agreed just as a line of the regularly scheduled testers walked in. One by one they were escorted into the testing room. Finally there was only me and someone I’ve never seen there. I asked what exam he was taking and surprisingly, it was for a TSA exam. Who knew there was an exam to be a TSA agent? Anyway, the proctor du jour came back and went through the usual “sign these forms to take the test routine” and went so far as to make him raise his pant legs to make sure there were no “prohibited materials” anywhere on his person. I had to get my dig in by informing him that we have to get our turn to search ‘em sometime in our lives… might as well be now. We all had a good laugh and in he went. Minutes later it was my turn. He Gets to Take What?! There I was… in the hot seat and ready to go. My testing cubicle was a little cramped to fit all the allowed material, but I managed. Wait! Allowed material? 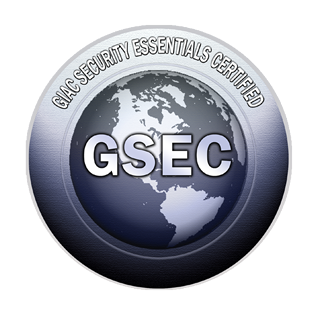 Yes, during the GSEC exam, you are allowed to have any printed material with you. No electronic funny stuff here. Just good ol’ paper and ink, or toner if you prefer. My space was limited so I stacked my books in heaps of three to the right. So books 1-3 are in one pile, and 4-6 are in another. I had my index to the left of me. This pretty well emulated how my practice exam sessions were setup. I felt sorry for the other testers that opted out of ear plugs. I always take them whether I need them or not. It is just far more comfortable that way for me while I test. I think the woman sitting next to me was a little frustrated even though she did opt in for the ear plug option. When I hit my 15 minute break and stepped outside to stretch my legs, the proctor informed me that the woman thought I was cheating when she noticed me flipping through my index several times. The proctor went on telling me that this woman got a bit upset, exclaiming “He gets to take what? !” With a little bit of distraction, I went back in and continued the exam. This exam is all about mental endurance. Even that 15 minute break is not enough to help out with the “attention deficit ‘oh squirrel’” I started getting towards the end. I had to continue to mention to myself that it will be over soon and to keep alert and focused on the task at hand. I eventually came down to the last question and saw that I had passed my exam. I also had a little over an hour and a half left on the clock. I fell short of the 90% needing to get on the GIAC advisory board. This was a goal that I kind of wanted to accomplish. Those that do get the 90% or better get invited to a board with other certified professionals to discuss issues related to GIAC and SANS. And so ends my exam day. I didn’t ride off into the sunset on a horse (you need 90% or better for that), but I went home feeling good knowing that the next GIAC exam will be better. It gives me another goal to accomplish in the future. It was an amazing journey; one that will not be soon forgotten.